Creating the bulletin board o’ evidence was a fun exercise in diving back into the history of the strip and thinking about the things Spy Gal would see as relevant. Pretty much the same thing the readers saw, as it turns out! I love the way Marc drew Jerry’s reaction in the third panel. That’s good stuff right there. And yet it’s the most obvious! Rule one of being married: Don’t laugh at your wife’s conspiracy theory. That should be in a book somewhere. Should add a subcategory for women who can phase her hand through your your rib cage and pull out your heart if she so felt inclined to do…which she might do when she find out what you did. wow jerry over react much? she is on to you son. Perhaps my memory is faulty but has the Third Man really made enough appearances for that kind of logic? Bingo Knight could be the Third Man by the same line of reasoning. I’m a little curious as to what that thing is that looks green and shiny and appears to be in a little plastic bag (just above the question mark at the right side of the board). As for the thing in the bag, see Scott’s comment below. @gnrrg — I’m going to guess that was the special bullet that Jerry was shot with. She’s almost there with her “Where does he go?” posting. Jerry better start finding some good distractions or he won’t be laughing that nervous laugh of his for long. Jerry, Spy Gal’s too tough to be belittled away from an idea. Btw, Brock, love to read your blog. Can’t comment for some reason though. When I do every single page of your blog is replaced with a blank, white page that says, “Invalid key . Back” or “0″ on it. DAG, what a punk. He really proves, over and over what a giant tool he is. How many strips is it gonna be before Vanessa actually just hauls off and decks him? Not too many, here’s hoping. The Big Holiday Wars Giveaway! To celebrate the launch of “Holiday Wars” Book 2 we are doing a massive three week contest where we will be giving away some awesome daily prizes; including a Kindle, and a Nook Simple Touch. 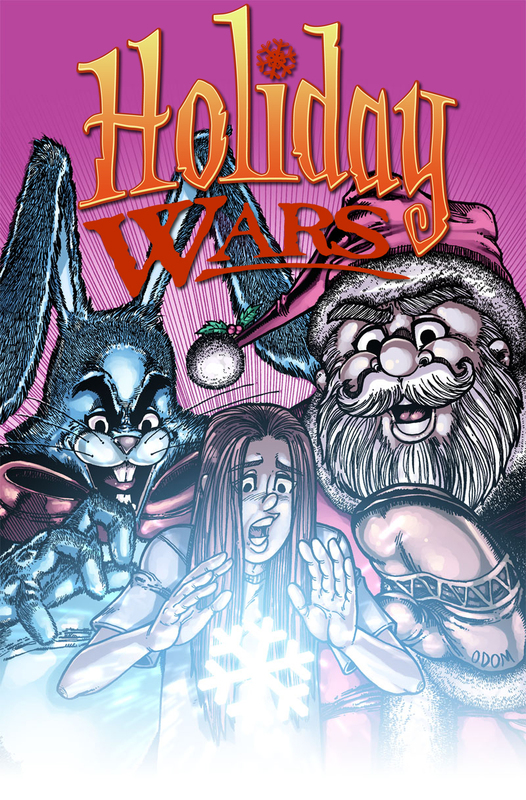 “Holiday Wars” is an ongoing webcomic about a teenage girl named Tegan Cassidy who discovers that the personification of holidays are real. The story takes place in our world and features well known holidays like Santa, The Easter Bunny, and April Fools as well as smaller observances like Ask A Stupid Question Day and Black Friday. 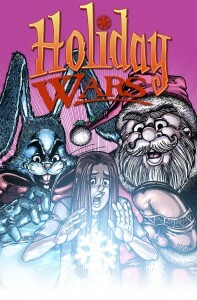 The comic is free to read at www.Holiday-Wars.com. Scott King was born in Washington D.C. and raised in Ocean City, Maryland. He received his undergraduate degree in film from Towson University, and his M.F.A. in film from American University. “DAD! A Documentary Graphic Novel,” King’s first book was published in Fall ’09. He is also the creator and writer of “Holiday Wars.” In addition to his work in comics, King is also a part-time faculty member at the University of Maryland Eastern Shore.